A fascinating vining plant that produces two types of leaves. Along with ordinary leaves, it develops large pouch-like leaves containing modified root structures that can absorb nutrients. When grown outdoors ants enter into the pouch through a small opening and use the hollow leaves for shelter and food storage. In return the plant is nourished by the carbon dioxide and waste the ants provide. Produces small red flowers year-round followed by interesting seed pods. This epiphyte is native to the Philippines where it grows on trees for support. 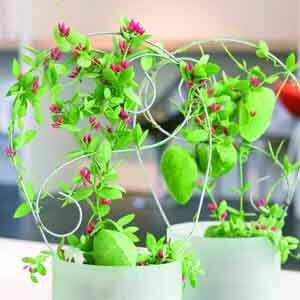 A terrific plant for pots or hanging baskets indoors or out. Ideal for growing in a container and training to a small trellis. May be displayed outdoors in warmer weather. Balanced liquid fertilizer every three months. Allow soil to dry between thorough waterings. Water thoroughly but allow soil to dry slightly between waterings. Apply a balanced liquid fertilizer every three months. Prune freely to maintain size. If the plant was purchased in a pot, then it is probably already in a quality potting mix and requires little more than watering and grooming. Epiphytes rarely need to be repotted. Epiphytes grow on other plants. They can be grown in a light, well-drained mix of bark, composted peat and perlite, or, rather than growing in a pot, epiphytes’ roots can be wrapped in sphagnum moss and the entire plant can then be mounted onto wood or other surfaces. When repotting, start with a good quality, sterile bark mix. Select a container with a drainage hole or be prepared to drill holes for drainage if there are none. Prepare the container by filling with potting mix up to 2” (5cm) from the rim of the planter. Make a small hole in the soil slightly larger than the root ball either by hand or using a trowel. Insert the plant into the hole and press soil firmly around the roots and just covering the root ball. Once potted, water thoroughly to settle the soil and give the plant a good start. Epiphytes prefer the bark mix to dry in between thorough watering. Check the bark mix moisture with your finger. If the top inch (3 cm) of bark is dry, it’s time to water. Apply water at the soil level if possible to avoid wetting the plant. Water the entire soil area until water runs out the base of the pot. This indicates that the soil is thoroughly wet. Discard any excess water that has accumulated in the pot’s saucer. Epiphytes that are not potted in a container should be misted well at least three times a week, more often if the air is dry. Mist all the foliage so that the water can absorb through the leaves. The plant can also be submerged in water for two to three minutes, once a week for a more thorough watering. Fertilizers are available in many forms: granulated, slow-release, liquid feeds, organic or synthetic. Liquid fertilizer is the best for plants that aren't potted in a container. These types of epiphytes absorb the plant food through the leaves. Select a product with a nutritional balance of 20-20-20 and dilute it to a quarter the recommended strength. Slow-release fertilizer is the best for potted epiphytes. Select a product with a nutritional balance of 20-20-20 and lightly sprinkle the plant food at the base of the plant. Too much fertilizer can damage plants so it’s important to follow the package directions to determine how much, and how often, to feed plants. Most epiphytes require little or no pruning. Cascading forms can be trimmed back to maintain a preferred size. To prune, choose a point along the stem where the leaves branch. Cut just above this point so the buds for new growth aren't removed. Some plants will re-bloom on their own, but others may have very specific day-length or temperature requirements to flower again. A bit of research may be necessary to determine what is needed to encourage future blooming.